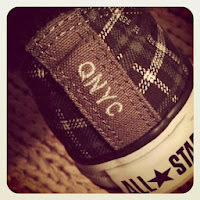 Quirky NY Chick: Holy Cow, We're 5 Years Old Today! Five years ago, in the wee hours of the morning, I got a crazy notion to start a blog. Given my propensity to procrastinate, get bored and in general lose interest in things, I didn't expect to have a first anniversary let alone a fifth anniversary! So, yay QNYC! Happy anniversary to me. This calls for cake and booze and music and cute men folk...perhaps not in that order. Thanks to everyone who has contributed in some way to keeping my little corner of the blog world alive. And, for the record, I'm still quirky...oh, and still female!